In a 4 to 6-quart stock pot large pot, heat the olive oil on medium heat. Add the onion, garlic and cook over medium heat until softened, about 6 minutes. Add the greens, season with lemon juice, amino and pepper and toss to wilt. Stir in the tomatoes, water and vinegar, cover and cook over low heat, stirring occasionally, until the greens are tender and the tomatoes are soft, 10 to 15 minutes. Transfer to a bowl and serve. Serves 4. Note. 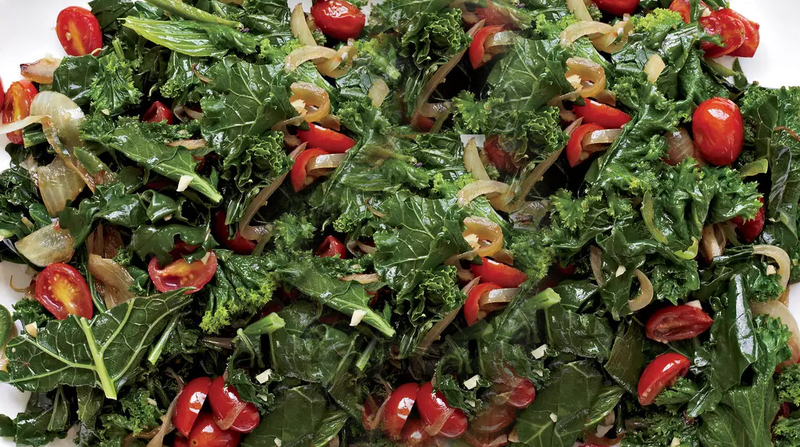 The braised greens and tomatoes can be refrigerated overnight and reheated the next day. Offer hot sauce or vinegar on the side as an option and let guests add their own. Collards, spinach, kale and other leafy greens are good for eye health Lutein and zeaxanthin, important plant pigments that can help stem the development of macular degeneration and cataracts. Broccoli, peas and avocados are also good sources of this powerful antioxidant duo. Tomatoes are packed with carotenoids, including lycopene, which helps give tomatoes their vibrant red color. Research shows that the lycopene present in ocular tissues helps prevent light-induced damage to the retina and other areas of the eye. Tomatoes are also an excellent source of vitamin C, another vision protector. Processed tomato products or fresh tomatoes eaten with a little olive oil will help boost the absorption of lycopene. Researchers say eating foods rich in antioxidants is better than taking supplements.